There was a popular song many years ago where the refrain went, “We need to get back to the Garden.” Well, today, 60 feet beneath the waves of Bonaire, I went back to a tiny piece of that Garden. But I’m getting ahead of myself. 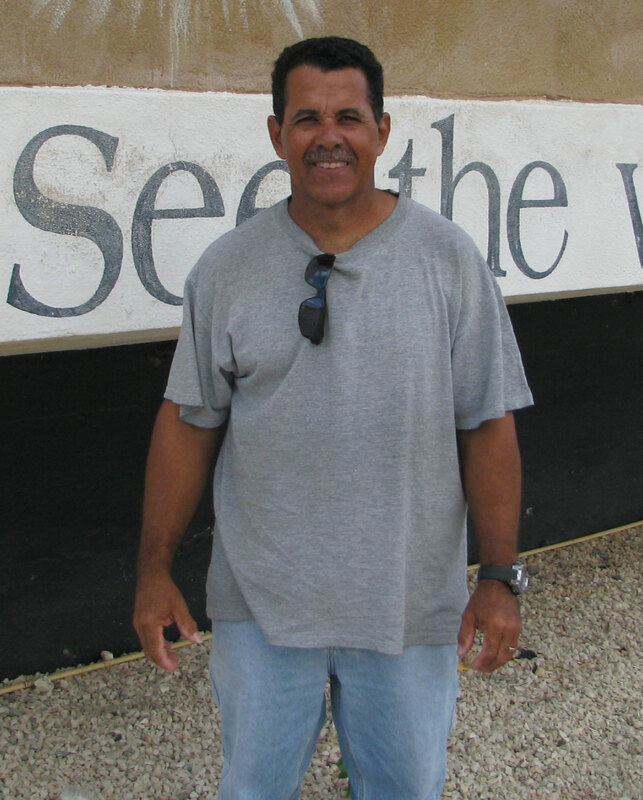 Ivan, one of our Bonairian workers, has been serving with TWR Bonaire for 36 years. As usual, at 8 o’clock we met at the studio where we held devotions. I love how the staff come together every morning to read the Bible and pray. I met one of the Bonarian workers, Ivan Statia, who has been working for Trans World Radio for 36 years. After devotions, Brandon made contact with the States to find out when the conference call would be. In the end, it was rescheduled for Thursday at 10 a.m. Please pray for this meeting today, as it will set the tone for the entire project that we are working on. I will be including my IT assistant, Pat Newman in Canada, in this conference call. With Dave’s help, I tried to get my iPad to recognize my micro SD card from the phone. After several attempts and Internet searches, we were unsuccessful. So I’ll be replacing my cell phone with my regular camera from now on. It is just not quite as handy. Dave has helped me with numerous issues on my iPad, which is just tremendous. He also invited me over to the pizza and movie night at his place this coming Friday. I must say, the entire staff certainly knows how to make someone feel welcome down here. With the finance person, Donna, I was also able to complete some refunds for expenses on my trip down. It was the afternoon when we discovered that the conference call would not go ahead, so Brandon suggested I take the rest of the afternoon off and get some diving in. I told him he didn’t have to twist my arm. I was able to hook up with Larry and Regina Sanders who did the tour yesterday. The really neat thing is that the Dive Flamingo’s dive shop has a system where they simply give you a door access code to the tank locker, which happens to be right across the road from my house. You simply grab a tank and mark it on the log sheet, and they bill your credit card later. We decided to go to the south part of the island, just short of Far Beach, to a spot called Pink Beach, since it used to have pink sand there. The dive marker is a fair distance from shore, so we swam out and then dropped down. We went to 60 feet, and swam along the to the left. One of the first things I spotted was a stonefish. It had just parked on the bottom and opened its mouth wide, so I moved closer to take a few shots. It was only then when I noticed that a tiny cleaner shrimp was inside its mouth, cleaning its teeth. I was just in complete awe of the spectacular beauty surrounding me. There were 5-foot- wide swaths of orange sponges. There were beautiful French angelfish, parrotfish, and so many others I couldn’t identify. I really think that the reef environment is closer to the original Garden of Eden that was on land. The intense variety of hundreds of species within a few square feet is just amazing! After we made the turn-around, Larry pointed to a large, spotted eagle ray about 30 feet from us. It was flapping away on the bottom, and apparently trying to fan away the sand in search of some meal. It was about 4 to 5 feet across, and had about a 10-foot long spiked tail. We got within about 20 feet before it spotted us. As it flew away, I marveled at the beauty of this creature that seems to fly effortlessly through the water. After we stowed our gear in my Jeep, we decided to continue on around the south tip of the island. The salt flats seemed to be very busy, and we saw the bulldozers harvesting the salt at one point. We also stopped by the slave huts and took a few pictures. Then we came across the kite boarding school. This is where a surfer is tethered to a large parabolic type of parachute that pulls them through the water at high speed. It is spectacular to watch. But at $300 for three hours of lessons, I don’t think I’ll be doing that anytime soon. Next we stopped by the lighthouse and took a few more pictures. Then we came across a large windmill near where the Sorbon Hotel used to be. A quick jog to the right, and we found a lot of people going windsurfing in Lac Bay. I think my sister, Joanna, will be doing that when she arrives here in about 4-1/2 weeks from now. As we drove back to the hotel, I was again impressed about how much development is taking place in Bonaire. It really has become a busy place. You have the impression that there are a lot of funds going into Bonaire right now. As I dropped them off at the hotel, we decided to meet again in an hour to go to lunch. After I had rinsed my equipment and showered, they met me at my house. We walked about 10 minutes into town, and found a lovely restaurant. It seems the waterfront is now so built up with restaurants that they offer competing specials. We had steak and shrimp for a very reasonable price. After we walked back to the Flamingo Hotel, Larry and I went out to the dock and sat admiring the waves and the stars, and talked for almost another hour. He is the director of Heralds for Christ, and was absolutely fascinating to speak with. His life experience is tremendously varied. We also looked across the water at the TWR towers, and discussed where the future of this wonderful ministry may be going. My thought was that we would begin to see more of a focus on Internet broadcasting. And so ends another absolutely spectacular day on Bonaire! I came home and greeted the four dogs that live in the backyard, and finally got to pet the small shy dog, Kiko. As I sit here now, I can’t help but praise the Lord for blessing me so richly.